Located in the heart of the Marina District, Watermark sits directly across the street from Seaport Village and Pantoja park. Watermark San Diego condos are also just steps away from fabulous bayside dining at The Fish Market and Roy’s Hawaiian Fusion Cuisine. 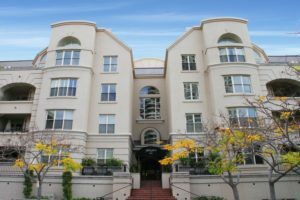 Watermark Condos San Diego is a five story mid-rise building with two separate lobby entrances and two separate addresses. Watermark’s 96 European style units were originally built in 1991, however the building was renovated in 2006. Upgrades at that time included new carpeting, lighting and wallpaper in the common areas as well as new windows throughout the building. Watermark floor plans include one, two and three bedroom residences ranging from 1,505-2,120 square feet. Condos at Watermark feel more like urban homes than your typical downtown San Diego condo. The ceilings are higher than most condos at 9’6″-16′ and the overall feel is more open than many other condo buildings. How do you want to spend your day? Ready. Set. Play!